Spring is here and with it comes all the new and tasty, green, yellow, orange and pink things popping up at the market and in my CSA (Farm Fresh To You). I'm still trying to figure out if the CSA system works for me as a single person that loves going to the farmer's market to pick out her own produce. The truth is, some weekends I'm too busy to go the farmer's market. The nice thing about the CSA is that I don't have to think about how I'm going to get quality organic produce into my kitchen. Also, I love getting surprised by seasonal items that I might not have thought to pick out on my own. For example: spring onions. 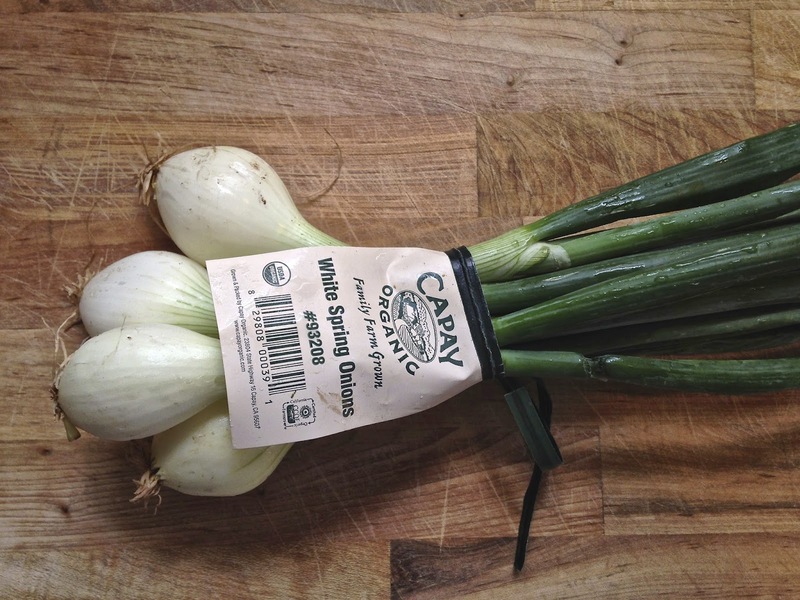 As much as I like onions, it's never really never occurred to me to seek out spring onions. Usually, I reach for the leeks instead. This bundle was delivered yesterday and I immediately felt inspired by these sweet and delicate onions. 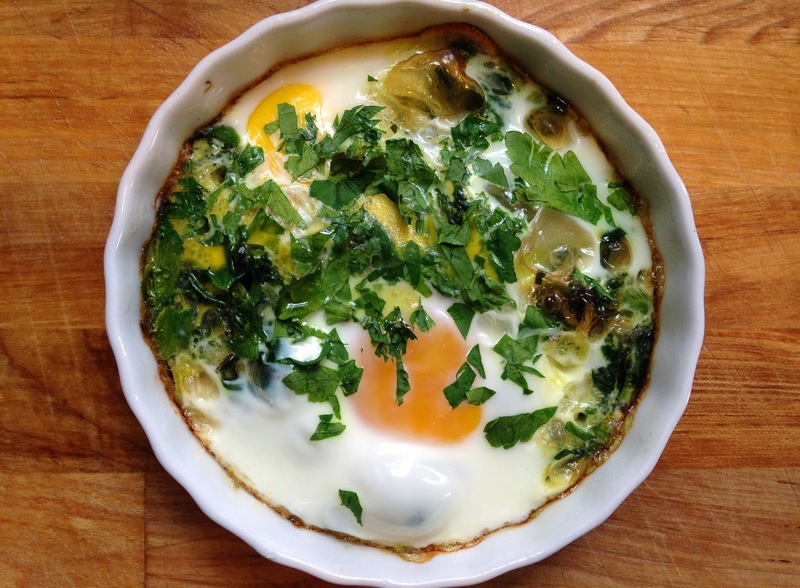 Baked eggs are such a foodie trick. They couldn't be easier, and they look so pretty baked in their own little white dishes (doesn't anything seem fancier when baked in its own dish?). Most importantly, baked eggs are delicious. I ate this for lunch with a small salad, and I left the table full and satisfied. This recipe works for breakfast, lunch, or dinner. You can add some cheese or sausage to the baking dish if you want something heartier. A splash of cream could add a nice richness to the dish, if you're so inclined. Tarragon or basil would be nice additions, too. 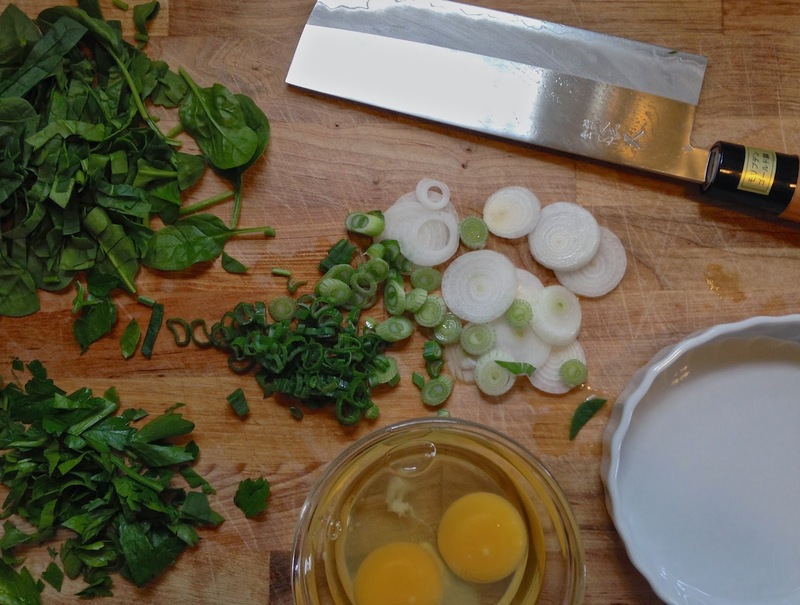 However you choose to compose your little egg dishes, you'll have a meal on your table in 20 minutes or less. Preheat the oven to 375°F. Spray two 6-oz. baking dishes with cooking spray. You can use a ramekin or whatever small baking dish you have (oval, round, square); smaller dishes will simply hold less of the filling, but they'll work perfectly well. Frankly, you can use large muffin tins if you don't have any baking dishes (use one egg instead of 2 per each cup). For the spray, I used coconut oil cooking spray, which adds a mild coconut flavor to the dish. Thinly slice your spring onions and roughly chop the spinach and flat leaf parsley. Set aside and reserve. In a pan on medium high heat, melt a teaspoon of butter with a teaspoon of olive oil. You could use just butter or just olive oil; I like the flavor of butter mixed with the lighter quality of oil. Add the spring onions to the pan, and sauté them until they soften and a lovely onion aroma wafts out of the pan, about 2-3 minutes. Add the spinach to the softened onions, and cook it until it just wilts, about 1 minute. Season with salt and pepper. Turn off the heat. Divide the onion and spinach mixture evenly between the baking dishes. Add two eggs to each dish. 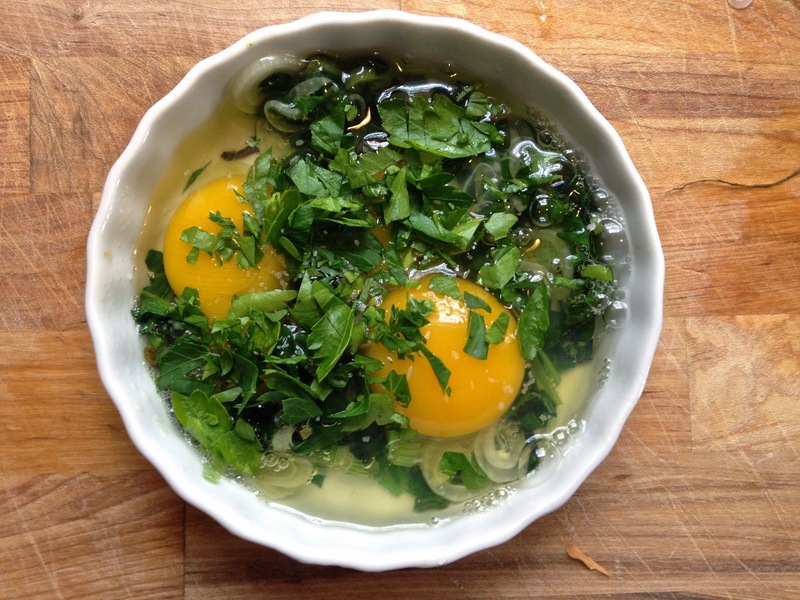 Top the eggs with chopped flat-leaf parsley. Sprinkle a little more salt over the eggs. Place the baking dishes on a baking sheet, and put the baking sheet in the oven for 15-18 minutes, or until the eggs have fully set, and the yolks are just slightly soft. Check your eggs after 10 minutes to gage their level of doneness. Serve with crusty bread, a side salad, and hot sauce. Enjoy each flavorful, fresh, buttery, onion-flavored bite! getting centered with a bowl of soup…. in july.